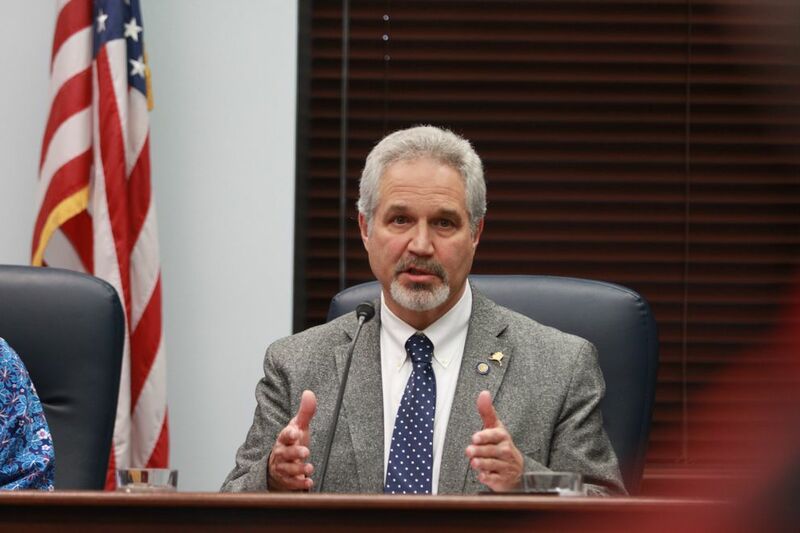 JUNEAU — The Alaska Legislature on Friday finished its first special session and began the next one hours later, as Gov. Bill Walker brought legislators back to resolve unfinished business. But for this second session, Walker set aside the proclamation for the full deficit reduction package that he made for the first to instead focus on just a budget that would avert a state government shutdown July 1. The Republican-led state Senate gaveled out Friday morning, rejecting a last-ditch operating budget offer from the largely Democratic House majority, which had adjourned Thursday evening. 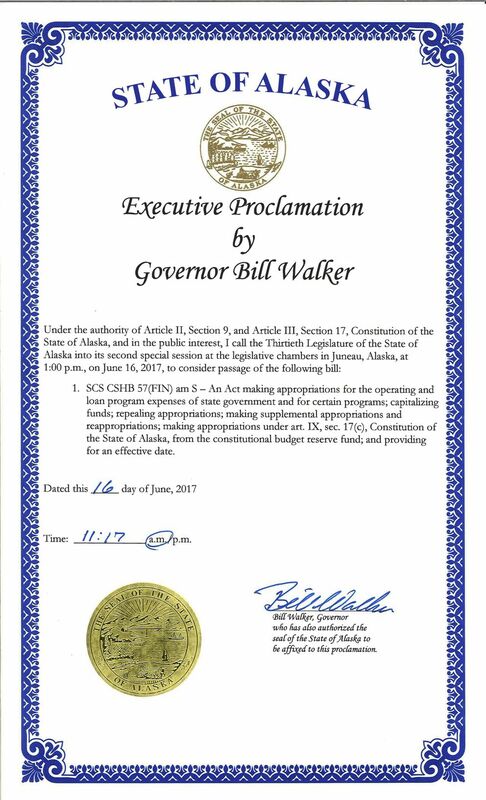 Four minutes after the Senate's adjournment, Walker signed his proclamation convening the next special session, which began at 1 p.m. The proclamation includes only a bill making appropriations for the state's next fiscal year, which starts July 1. Lawmakers have yet to agree on one, and their paralysis risks a government shutdown in two weeks, which would shutter all but essential state services. Walker, at a hastily called news conference in his third-floor Capitol office, said he remains committed to getting new revenue bills — like taxes — through the Legislature, adding that the state's huge deficit will ultimately force their adoption. But he cited lobbying from "businesses, and business people" that convinced him that averting a shutdown should now be the Legislature's sole focus. "I'm giving up on nothing. I'm not giving up on measures of the full fiscal plan at all," he said. "I'm measuring them out. I'm putting out on the call what we need to be focused on right now — we need to remain focused on the operating budget." 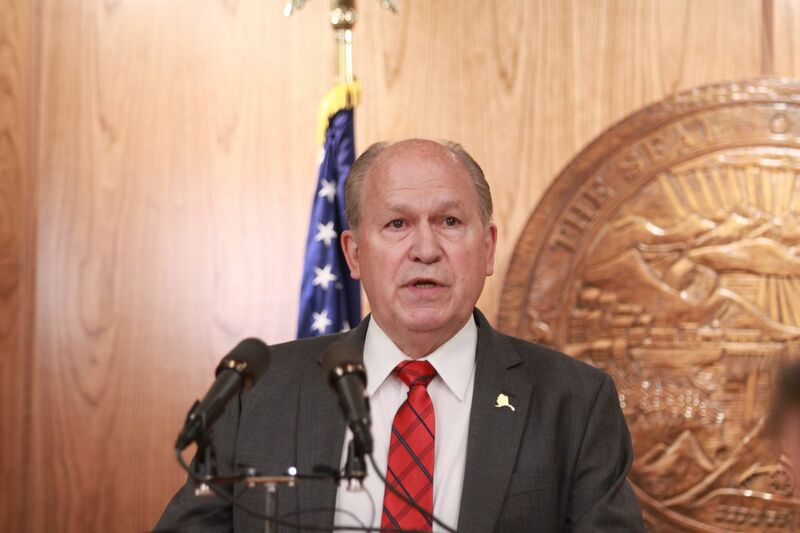 The gridlock in Juneau echoes last year's legislative proceedings, which started with Walker pushing a package of 10 bills to close the state's multibillion-dollar deficit. It ended with just one, an oil and gas tax bill, being approved after three months of extra time. This year, the House and Senate majorities each advanced their own deficit-reduction plans, but neither has been willing to accept the proposal offered by the other, and their dispute has also tangled up the operating budget. In dueling news conferences, House and Senate leaders Friday offered competing narratives to explain the failure of their negotiations on the annual appropriations bill this week. House leaders said Senate majority negotiators had refused all their proposals to generate new revenue for state government with a broad-based tax — even those structured differently, and raising less cash, than the House's original income tax plan, which would have raised $700 million, with higher-earners paying the most. "The response we got yesterday was that that just wasn't something that the other body could work with," said House Speaker Bryce Edgmon, D-Dillingham. "For our group — you've heard many times, you've heard it this morning — that was just a nonstarter." Senate leaders, meanwhile, said they refused to let the House use the state appropriations bill — and the threat of a government shutdown — to pressure them on the broader debate over taxes and a deficit-reduction plan. The Senate majority opposes taxes and has favored using Permanent Fund investment earnings to shrink Alaska's $2.5 billion deficit to more like a half-billion dollars — a level that state savings could sustain for more than five years. "What I find alarming is that there is this continued notion that you can leverage an entire chamber to do what you want them to do because you want something," said Eagle River Republican Sen. Anna MacKinnon. "The people of Alaska deserve better. The people of Alaska need an operating budget and they need it now." Senate leaders said they would be willing to consider revenue measures in the future — but not before approving an appropriations bill. "This special session is about the operating budget," said Senate President Pete Kelly, R-Fairbanks. "We are not supporting anything except for an operating budget right now." Both the House and Senate adjourned Friday's floor sessions until Monday, suggesting lawmakers will give themselves a cooling-off period after a heated few days at the Capitol. Kelly said his majority was still "open for negotiation," though he added that members felt "slighted" after the House majority's decision to abandon negotiations late Thursday and attempt to push through a last-minute spending plan. The move sent a take-it-or-leave-it appropriations bill to the Senate. But Kelly quickly dismissed the offer — which reflected several House majority priorities like a doubled Permanent Fund dividend and a reversal of Senate cuts to schools — as untenable. Critics also said the House's last-ditch budget offer wasn't credible because of the failure of its effective date clause, which requires a two-thirds majority vote. That means the budget wouldn't have taken effect until 90 days after being signed by Walker — long after the start to a government shutdown. At the House majority's news conference, Homer Rep. Paul Seaton, one of three GOP members of House leadership, cited unspecified legal opinions saying Walker's administration could have borrowed money against a savings account to cover operations before the state appropriations bill took effect. A House majority spokesman said the opinions were unavailable to reporters. Alaska residents and business owners have reacted to the legislative dysfunction with a mix of exasperation, resignation and increasing anxiety. A coalition of commercial fisheries advocates delivered a letter to lawmakers this week that warned of "catastrophic" impacts of a shutdown, which it described as an "imminent threat to the salmon industry." In Whittier, southeast of Anchorage on Prince William Sound, residents and business owners are waiting for the news that lawmakers have averted a shutdown that could close the state-run tunnel that provides the town's sole access to the road system. "We're all talking about it," said Kelly Bender, co-owner of a charter boat service and president of the Whittier Chamber of Commerce. "Everybody says, 'Oh, no way — they couldn't possibly shut down the tunnel,' " she said. "You can't get your arms around the idea that they're not going to get it together to pass a budget and that they could actually let this happen — how chaotic and devastating it could be in so many ways. But it sure feels like nothing is happening."